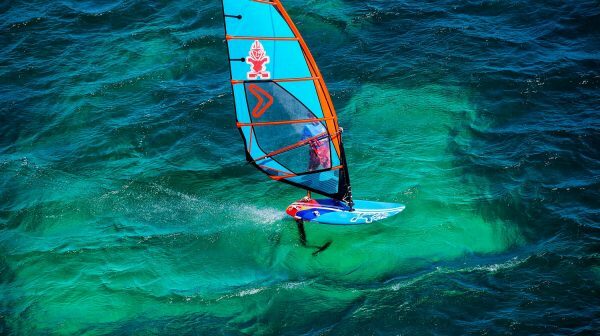 Windsurf foiling is a new way of wind riding. It allows you to make the most of all conditions, including the less breezy days. Without talking too much jibber jabber, it is like flying above the water. A foil is an extra piece of equipment added to the bottom of the board. It lifts the board up and out of the water, allowing you to windsurf with less water resistance. With a safe sailing zone, deep waters and the perfect breeze, Lixouri Beach club has the perfect conditions to try wind foiling. It’s a safe haven for anyone who is learning, we are the only people on the water and with the reliable cross shore breeze, it is a great place to be in your element. Expect cross shore conditions: a light morning Southerly breeze, building in the afternoon and switching to northerly, bringing exciting sailing conditions for the afternoon. Just head over to the beach, let the friendly instructors know, choose your kit and have a great time on the water. If you need any help let us know, our safety team are always out on the water, available to give you a hand or any helpful tips. If you would like foil tuition, our instructors are the best! They all spend most lunch times and… well any other free time they get on the water! The foil has proven to be an instructor favourite. We don’t run specific courses, but can provide taster 1 to 1 sessions. Anyone wanting to have a go on a foil must have prior windsurfing experience including using foot straps and a harness. Just ask a staff member or get some more information when booking. Friends and family can easily watch you from our beach bar or up at the hotel that looks out on to the sailing area! We pride ourselves on having well maintained and up-to-date kit. Across our two beach clubs we have a range of Kit. The kit list is constantly changing as we keep it up to date, so feel free to get in touch to ask us for availability of specific kit during your holiday. Here are some of our current sails and boards we have in resort. Which beach club for windsurF Foiling? With an open sandy beach Lixouri makes windsurfing safe and accessible. It is deep enough and safe to foil around with few other water users. Lixouri club has a gradual sloping beach so you can ease yourself in or get the picture of windsurfing you have always wanted. With no neighbours, we have a great open water area for you to enjoy. Our cross-shore breeze allows you to easily launch and land off the sandy beach. Our exclusive sailing area is situated in an inlet bay of Kefalonia; making for safe sailing with beautiful scenery. Never Windsurfed before, but always wanted to try? 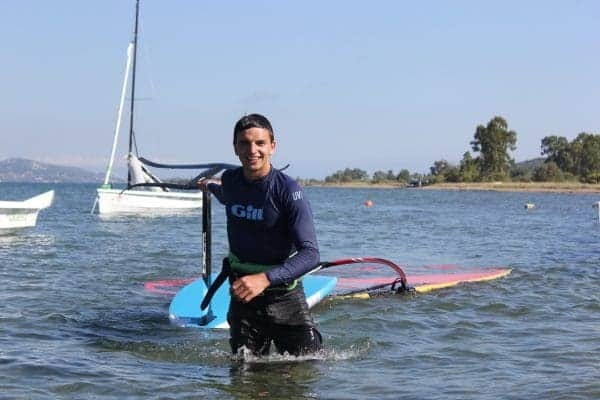 Check out our Beginner Windsurfing clinics!